The Email Listing Report, found in the Email / Text / Marketing and Families / Students sections of the Reports menu, lists contact and student email addresses for each family/account that meets the search criteria you choose. Using your selected criteria, Jackrabbit will compile a listing of email addresses for contacts and students in family records that meet ALL of the criteria chosen. 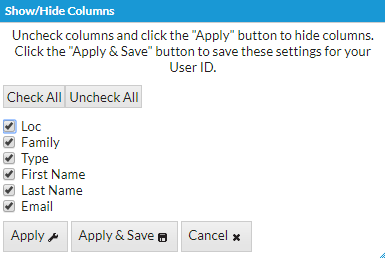 In the report results, using the Show/Hide Columns button, you have the option to select which columns of information for the contacts that you want displayed. Where this report's main purpose is to list email addresses, there are many more reports in Jackrabbit that will also give the email address. The Email Listing Report is frequently used to create a list to upload into an external marketing program. The report can be exported into Excel (or a .csv file) and then uploaded to an email marketing program, such as Constant Contact or MailChimp.